I don’t have to work hard to recall the first time I became familiar with the voice of Ms. Maya Angelou. I was a young child when I sat in front of our huge floor model television with my family watching Ms. Angelou in a rare TV event, black miniseries called Roots. Just two years later, I sat in front of that same television and excitedly watched another too rare TV event that completely transfixed me, the adaptation of I Know Why the Caged Bird Sings starring the late Esther Rolle and Diahann Carroll with Constance Good as a young Maya. It was rare because the voice of a young black girl was hardly ever the center of a television movie. I read the book for the first time in that next two years. I Know Why the Caged Bird Sings was the autobiography that turned me on to a whole genre of African American writing that I’d never been introduced to yet fully either in school or out. Marguerite’s painful, beautiful journey from voice to silence to the realization of voice and poetry captured for me the power of the written and spoken word. It helped bring into my consciousness something I had been actively doing since the age of nine or ten: I wanted to be a writer. 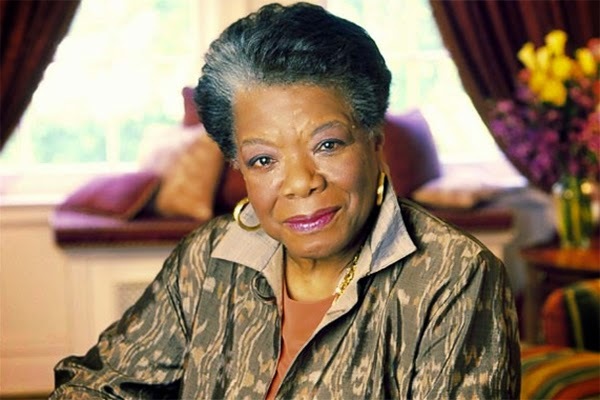 Once I discovered Ms. Angelou’s memoir, I was hooked and devoured the library the next couple of years, reading a slew of autobiographies like Richard Wright’s Black Boy, Anne Moody’s Coming of Age in Mississippi, The Autobiography of Malcolm X, and the seven installments in Ms.. Angelou’s story, including Gather Together in My Name (1974), Singin’ and Swingin’ and Getting Merry Like Christmas (1976), and The Heart of a Woman (1981). They are prized treasures on my bookcase. That first though, I Know Why the Caged Bird Sings, is one of the texts of my life. I refer to it on the very first page of the preface to my book and reference to it in a play I finished recently. I, like so many others, have performed her poems, favorites like “Still I Rise” and “Phenomenal Woman.” Her words together are a soundtrack that articulates the vitality, beauty, strength, and history that define my humanity, my black woman-ness. She captured the marvelousness of our dance, triumph and survival. Over the years, I bordered on envying the bevy of public folk like Oprah, her ‘daughter’, who were obviously downright awed and captivated as they sat across from her, not really interviewing her but listening, taking in the wisdom that was in every measured, thoughtful word she spoke. There is no time that I heard her on screen, radio, or Internet that I could stop listening and then marvel how it was that she could be always such a model of art, of grace, and self-beauty. Author, writer, activist, dancer, poet, filmmaker, actress, seer—she personified inner beauty radiating out, not merely aging but constantly evolving and embracing our mutual humanity and life. She commanded and exuded respect and thus spoke across generations from her peers to Hip Hop. Just as she showed us in life the intrinsic rewards of choosing to fiercely embrace our mutual humanity and the journey to becoming all that is possible, she showed us how to transition with the same embrace, leaving us with the might of her words – and over twitter ‘cause she was that kind of timeless cool: Listen to yourself and in that quietude, you might hear the voice of God.